Charlotte Lee (author of "And All The World Was Silent") has crafted another exquisite text, perfect for Advent or Christmas Day. Douglas Wagner intertwines an original melody with "Away in a Manger" (Kirkpatrick tune) to create this moving anthem. 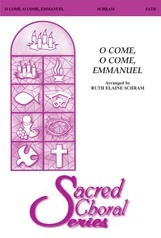 The score includes optional narration -- an ideal way to involve your minister in the performance.